David fixes a good breakfast for me and a large group. He is doing it all, never saw Audrey. The sun is out with a few clouds. There was rain last night and more may be on the way. 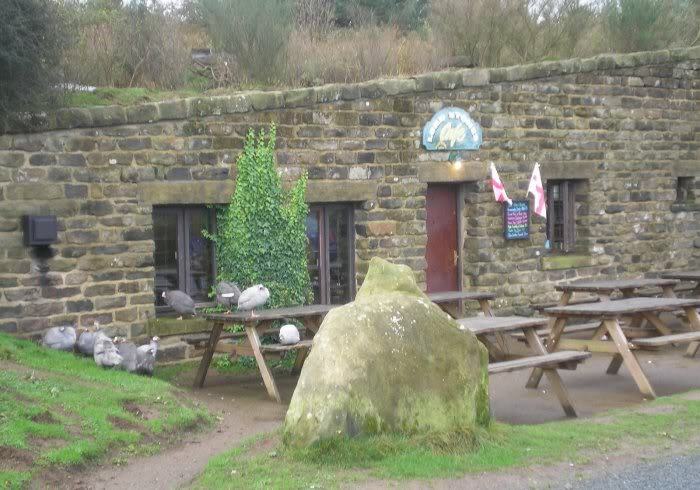 Its a good climb past Park House up through Cleveland Forest to the junction of the Cleveland Way path from Osmotherly. 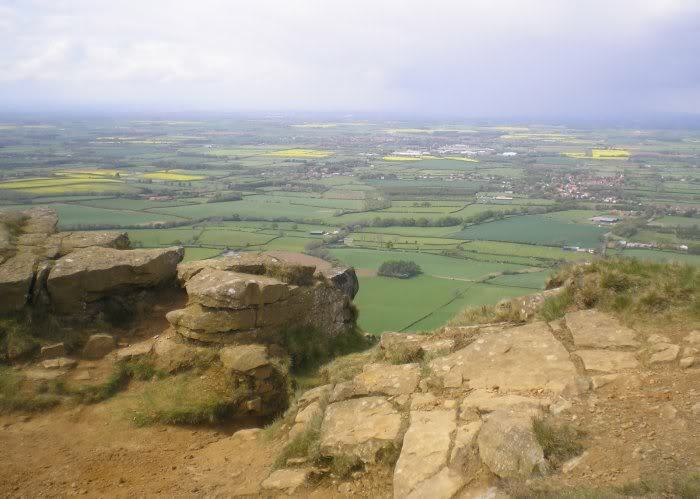 I was last here in 2006, walking the Cleveland Way from Helmsley and continuing on the C2C to the coast. 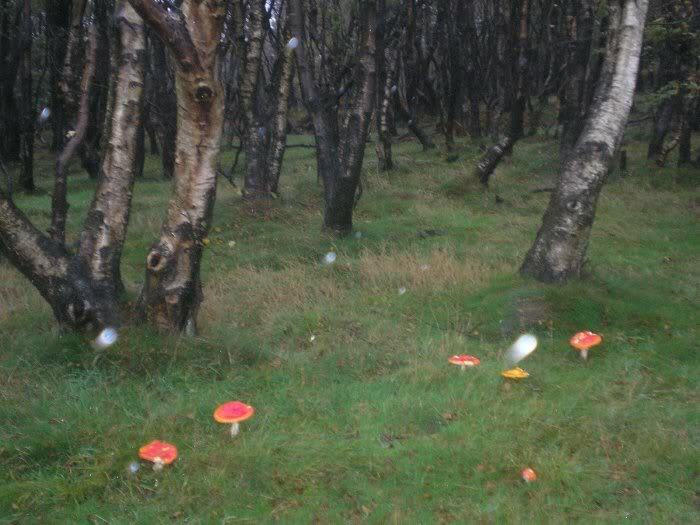 Photos from that walk will be shown along with photos from this walk starting with my overnight in Osmotherly. 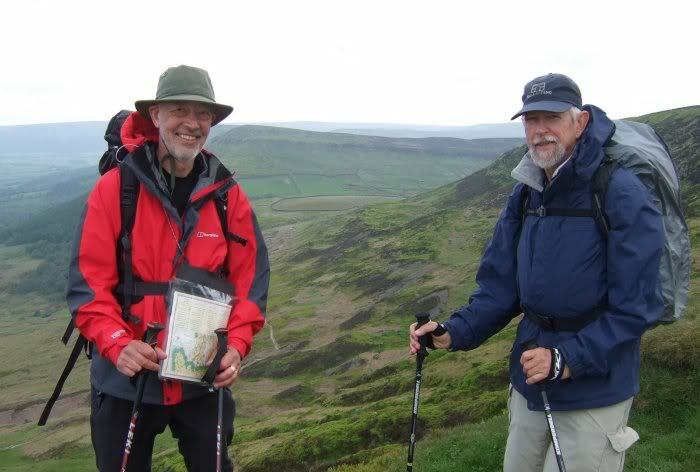 Friends I met on that walk, I call them the "Foursome", are walking the complete Cleveland Way; I first saw them in Helmsley and will see them later on the 2006 walk. 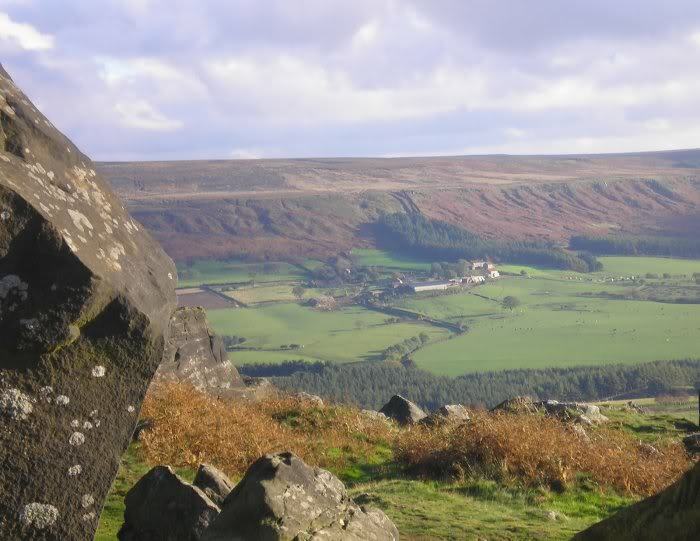 After passing the microwave station, I break out of the trees onto Scarf Moor, a protected area overlooking the Vale of Mobray, wonderful views and fine walking. It starts raining and I put the Duck's Back on my pack. It was raining in 2006 also. 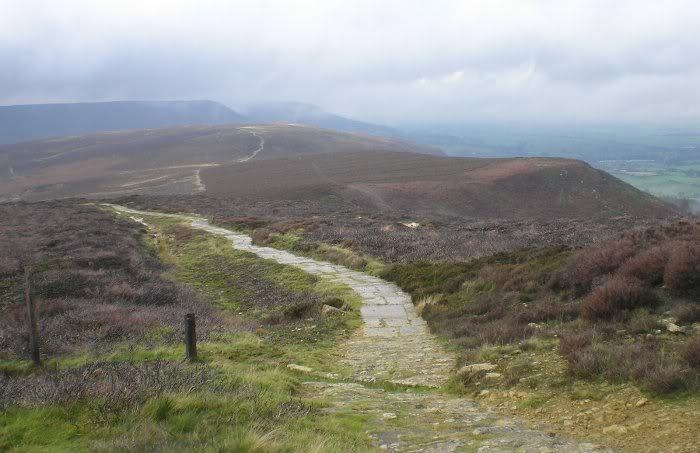 Here, the C2C is coexistant with the Cleveland Way which, being a National Trail, is well maintained and way marked (the C2C is neither well maintained nor well marked). As I was admiring the bluebells of Cline Wood, I met Tim, a local amateur historian out walking with his dog Sable. As we passed through areas of shale, jet mines and ironstone mining he explained the history and economic significance of the local mining industry. Tim pointed out hidden quarries and told of the extensive 19th century railroad system carrying ironstone ore to smelters and jet to workshops. Jet comes from Monkey Puzzle trees of the dinosaur age and became the rage when Queen Victoria wore black jet jewelry to mourn the death of Prince Albert. Dinosaur fossils still wash up on the shore at Whitby and diving for jet in the seabed was quite a sport when jet was more popular..
Near Scugdale Beck, we catch up with Henry and Jane who had stayed at Park House and got a jump on me this morning. 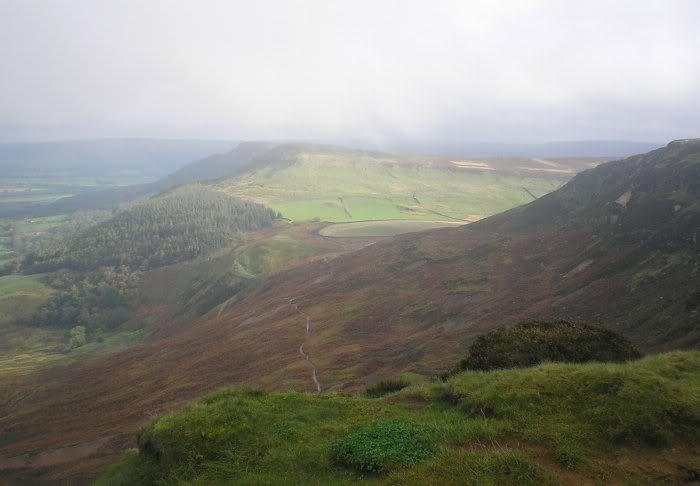 Tim left us at Huthwaite Green and us three made the steep ascent onto Live Moor (like Scarth Moor, a protected area). Then it was summit after summit until Lordstone's Cafe. Jane says we will top six summits today. and totally hidden from the path, so when I led them through the trees and around to the front entrance with its outdoor tables, he was dumbfounded. They had a packed lunch, so got a pot of tea at the cafe while I had soup with a roll. At Lordstones, we saw most of today’s walkers, Bill and Katie, four Australians and the van supported group. 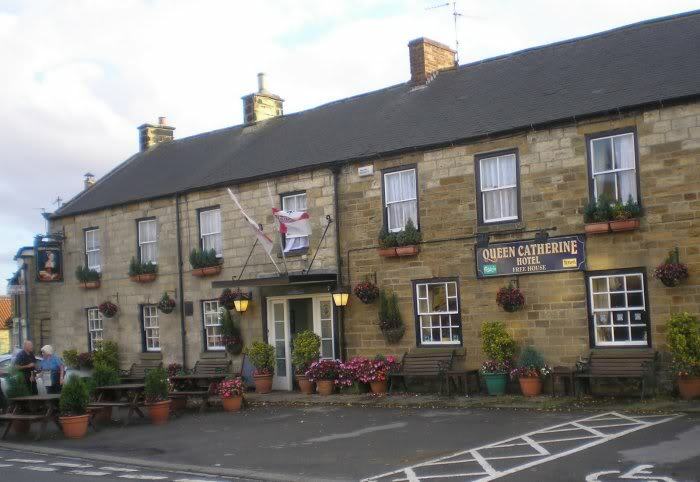 In 2006, I met up here with my walker friends from Osmotherly and had my pint of John Smith. 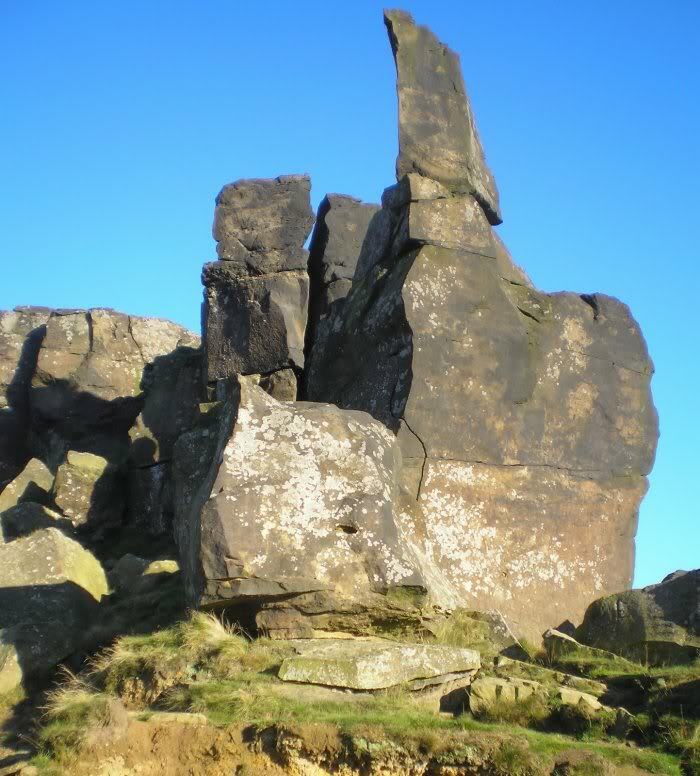 This is one of the best day’s walks, great weather, six peaks to climb, five moors to cross and the unusual group of huge boulders called the Wainstones. 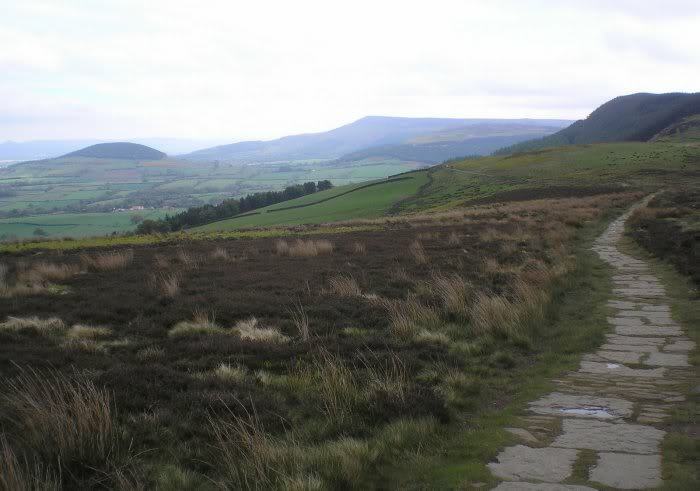 I continue walking with Henry and Jane and quickly pass the Australians at Cringle Moor. Up on Hasty Bank at the Wainstones, we can see Great Broughton to the north and Urra to the southwest where I stayed three years ago at Maltkiln House and where Bill and Katie are staying tonight. 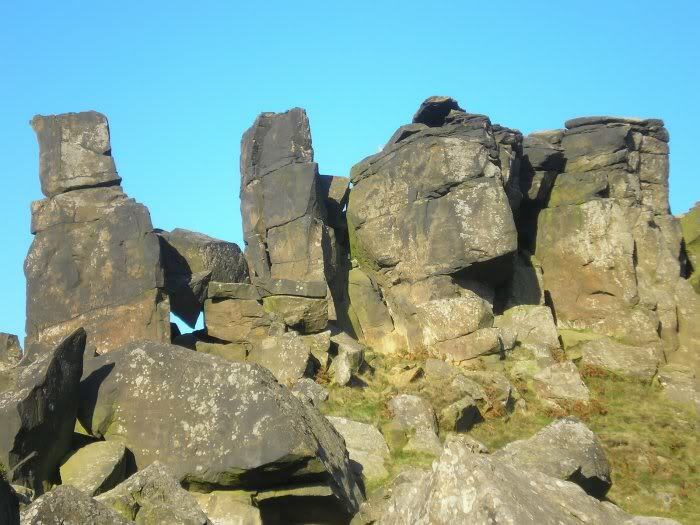 The Wainstones is one of my favorite places, but we don't tarry as I did in 2006, but stride out along the high cliff of Hasty Bank to Clay Bank Top. 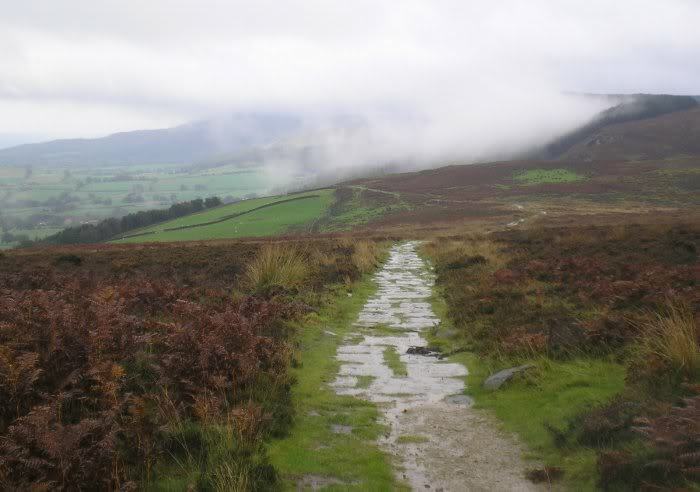 Descending to Clay Bank Top, we decided to walk the two road miles into Great Broughton and our b&bs. Big mistake! It was a long two miles with traffic, poor verge, not fun. A poor ending to a beautiful day's walk. We could have called one of our b&bs for a ride and should have. H & J are at Newlands House and I'm just up the road at Ingle Hill B&B. At the b&b, Margaret takes me into the sun room where the Australians were having scones and tea (they had called for a ride). 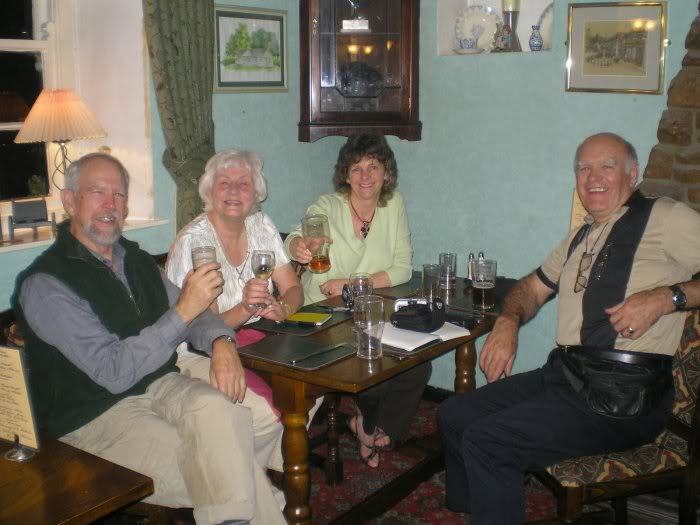 I meet H & J at the Jet Miners Inn for dinner, the four Australians were there also. I had a lamb shank w/salad and a Black Sheep ale. Henry insists on buying, saying it was an honor and pleasure to meet me. I could say the same about them. 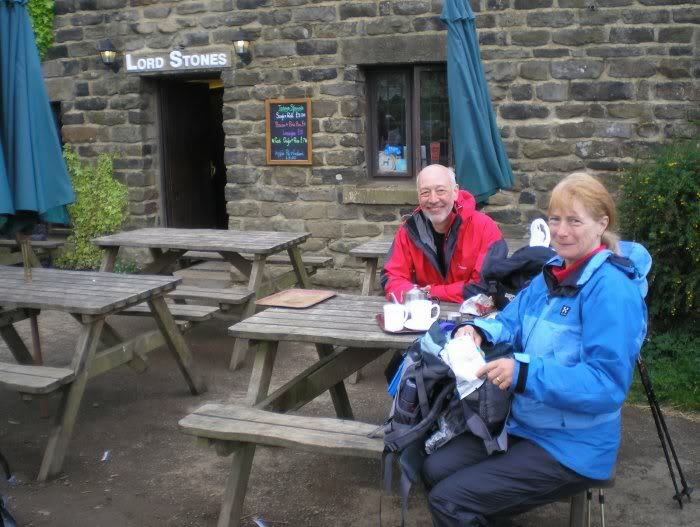 They will all be stopping at the Lion Inn tomorrow while I go on to Glaisdale, so I won't see them again. 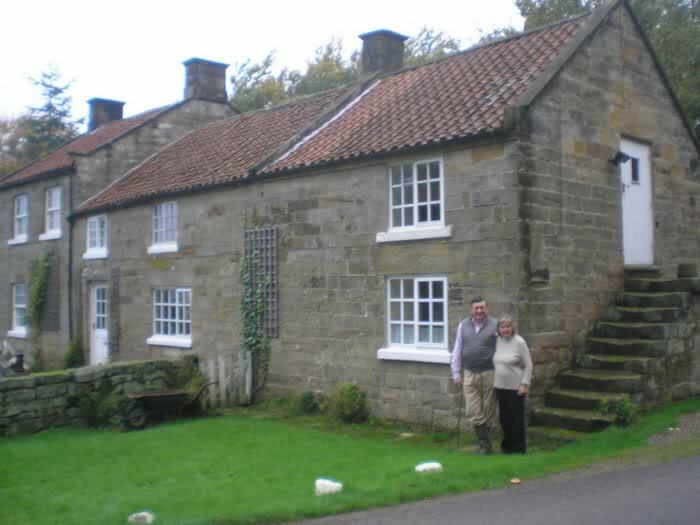 I should see Bill and Katie in Glaisdale at the Arncliffe Arms for dinner. Back at the b&b, I talked to Margaret for awhile. She is running the place by herself now since her husband died only one month ago at 88 years old. She seems about 10 years younger, a big job at her age. Can she keep the b&b going by herself? I hope to get an early start in the morning; her daughter Mandy will drive me back to the C2C at Clay Bank Top. 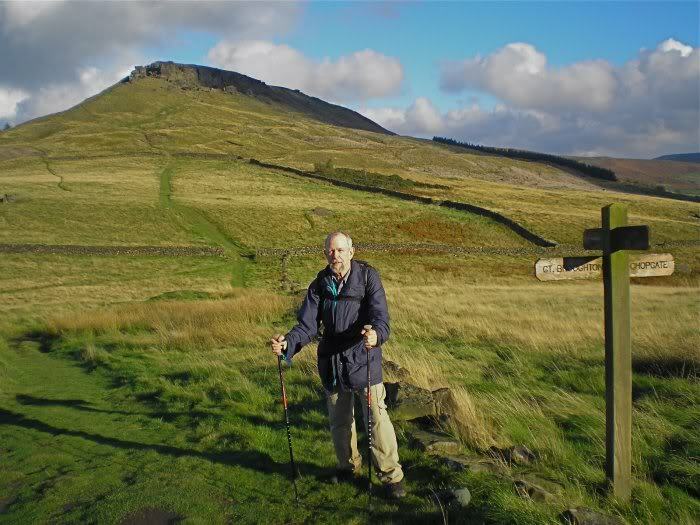 In 2006, when I stayed at Maltkiln House in Urra, Jerry showed me a path that led past jet mines up onto Urra Moor and linking up with the C2C on Carr Ridge. 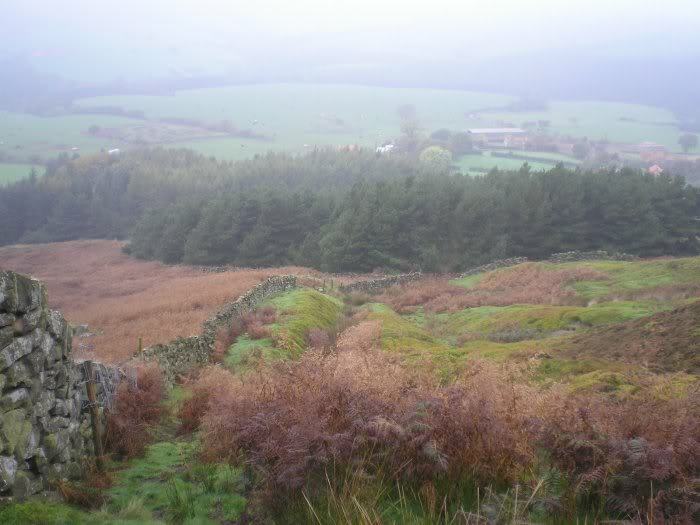 It was foggy and misty that morning, the kind of day where I expected to see a wolf running across the moors. I expect tomorrow morning will be a bit brighter. Some local history courtesy of Jerry at the Maltkin House in 2006. Urra is in Bilsdale, named after William the Conqueror (Bill) who came through here on his way to York as a shortcut. His army had to take a longer way. However, he caught a cold and had to stay until recovered, causing no little amount of worry to his army.